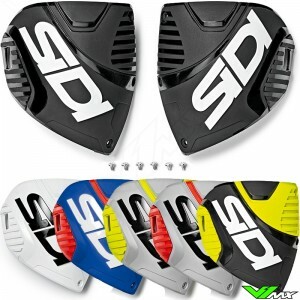 Sidi has completely redesigned its legendary Crossfire line to provide maximum levels of protection and performance. Check out the full range below. The Sidi Crossfire 3 is full of new technical features. The most important features are explained below. 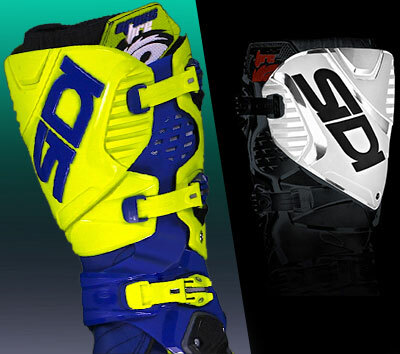 Sidi uses innovative materials to make the motocross boots lighter and stronger. An example of this is the Technomicro material. This is a composite material that behaves like natural leather, with the advantage of more strength, softer structure and lower weight. Moreover the Technomicro is very durable and resistant to wear. The front has a lot of impact protection to protect the rider against stones and branches. In addition , the gaiter offers a good seal to prevent the water and dirt from entering. 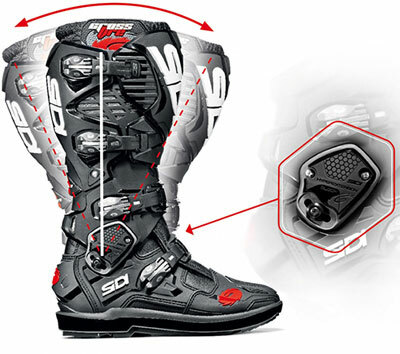 The upper part of the Sidi Crossfire 3 has an adjustable shin and calf plate. 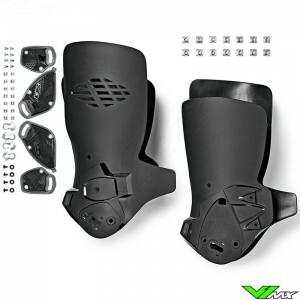 This is very useful for riders with wide calves and for riders who wear knee guards or a knee brace. A heat resistant rubber insert is placed on the medial side. The rubber has several important functions. First, it must offer a lot of grip against the dirt bike, to make sure the rider has optimum control over the dirt bike. Secondly, the heat-resistant material offers protection against the heat of the exhaust. 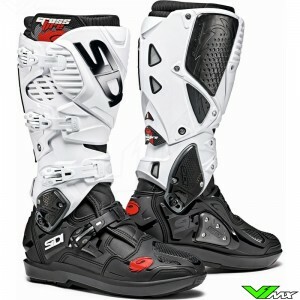 Sidi has opted for strong durable materials, which increases the lifetime of the motocross boots. 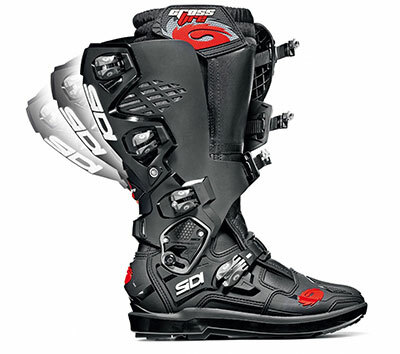 Sidi designed the crossfire 3 without inner booties. This is done for two reasons. First, an inner bootie will make the complete construction thicker. This will have negative effects on the ride-ability of the boots, for example, when shifting gears. Secondly, it retains heat which reduces the riders performance in warm weather conditions. The construction of the Crossfire 3 has a slim design with an aggressive and modern look. The nose section is made of strong and durable plastic. This serves as protection for lower materials and protects the rider in the though off-road conditions. A grip pattern is fitted on the nose piece for maximum control over the gear pedal. 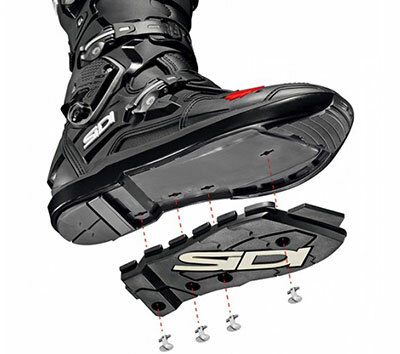 The Sidi Crossfire 3 has a flexible pivot system in the ankle, which is called the hyper extension block. This system helps prevent hyperextension of the riders ankle. Hyper extension is a movement that goes beyond he natural range of your body. Muscles, tendons and bones are not made for this and can be damaged by such a movement. With the hyper extension block you are guaranteed of maximum protection. The system and many other parts of the boots are easily replaceable. 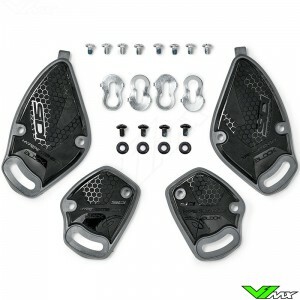 V1mx has most of the parts for these motocross boots available in the webshop. The inside has also been improved with the new version. Cambrelle and Teflon mesh material make your ride a lot more comfortable. The combination of these materials offer a soft fit and ensure maximum absorption of water, so sweat and penetrated water is quickly absorbed. The soles of the Sidi Crossfire 3 SRS have been redesigned. They can now be fixed with 4 screws that can be mounted and loosened with a simple flat head screw driver. 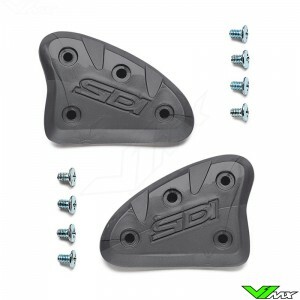 Soles inserts are available for both motocross and enduro use. The motocross version has a flat design with a compound that offers a lot of grip and durability. Enduro soles are designed for extra grip on sand and muddy surfaces. This makes it easier to push your dirt bike on steep slopes and obstacles. The soles can be bought separately in the webshop of V1mx. Please note, These soles are only on the SRS version of the Crossfire 3. The version with a traditional stitched sole has no replaceable sole insert. In addition to the outsole, the insole has been further developed. It has an improved anatomical shape which offers a more solid fit inside the boots. It also has a positive effect on impact damping and protection of the foot, because forces are better distributed in case of an impact. Crossfire 3 motocross boots don’t need a lot of time to break-in, because of the unique flexible design. They almost immediately feel smooth, thanks to the built-in hinge system. 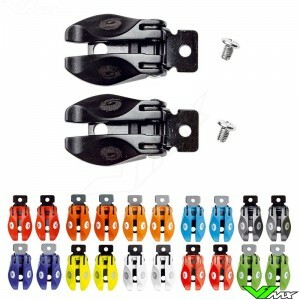 The hinge system is places above the ankle and helps riders by moving more easily on the bike. In addition, it also helps to offer a personal fit. The calf section automatically sets to the body posture and shape of the rider. When tightening the upper buckle, the calf pad is pressed for a good fixture around the foot. 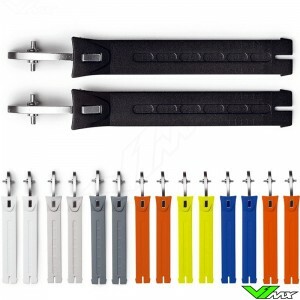 The buckle system is easy to use and very strong due to the design with plastic and aluminium. Once you have set the buckles, the position will be saved. 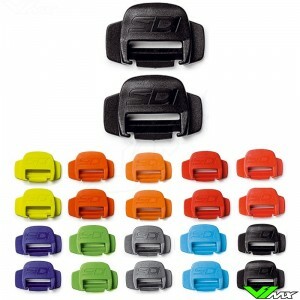 So you won’t waste time on the track, because you have to set your buckles properly. 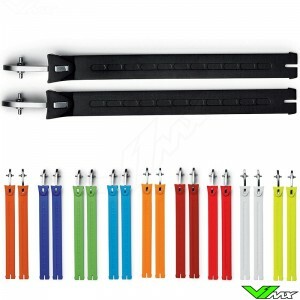 In addition, this buckle system will offer you a constant fit and comfortable fixture. 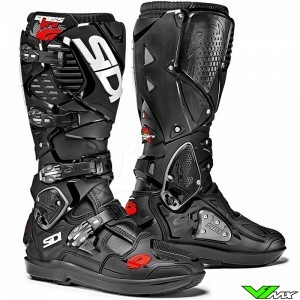 Sidi uses the same buckle design for all modern models. 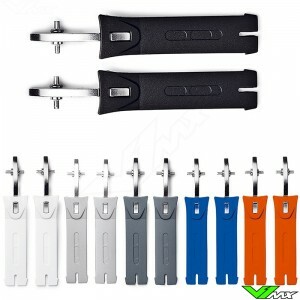 The buckles, straps and other accessories are available separately in a large choice of colors. So you always have the possibility of personalizing it with colors or replace a broken part. 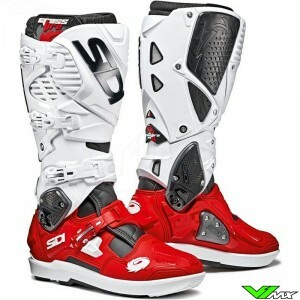 9-time world champion Tony Cairoli has won all of his championships in Sidi motocross boots. 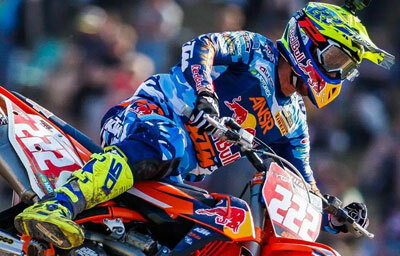 During the races in the World Motocross Championship, he competes with the fastest riders in the world. It is important to get through the season injury free. 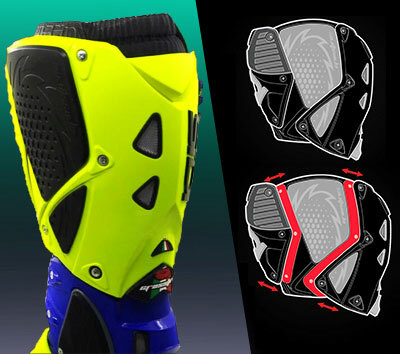 Tony Cairoli main demands for motocross boots are comfort and protection, to make sure he is able to ride to his maximum performance. He also loves the iconic style of Sidi and the bright colors they have available in their range. 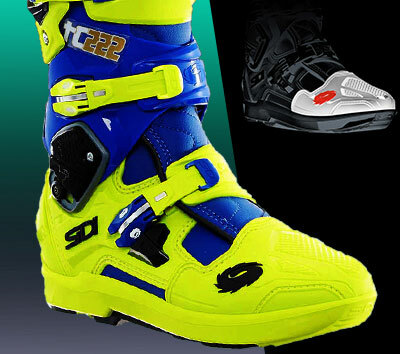 Over the years, Cairoli and Sidi have introduced many new boots. 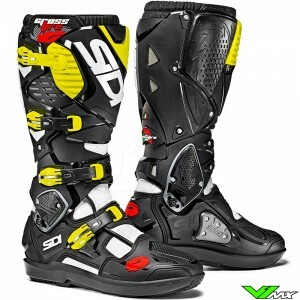 The Sidi riders are closely involved in the development to perfect the off-road equipment. 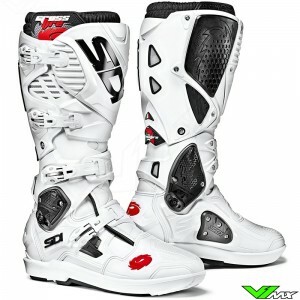 Do you have any questions about these motocross boots? Feel free to contact V1mx. We will gladly answer your question and help you choose the right motocross gear. You can also reach us for questions about ordering or shipping.